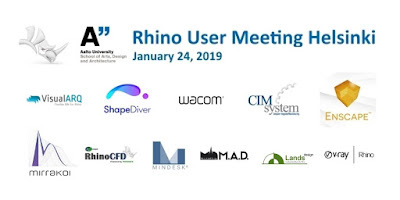 McNeel Europe is pleased to announce an upcoming Rhino User Meeting at Aalto University in Helsinki happening on January 24, 2019. Get the latest news about Rhino WIP, Rhino Inside, Rhino Compute, RhinoVR, Grasshopper and food4Rhino. Coffee breaks, lunch, and networking drinks are included within the ticket price! If you would like to present your projects, workflows, or research work (Rhino or Grasshopper related), please fill in this form.